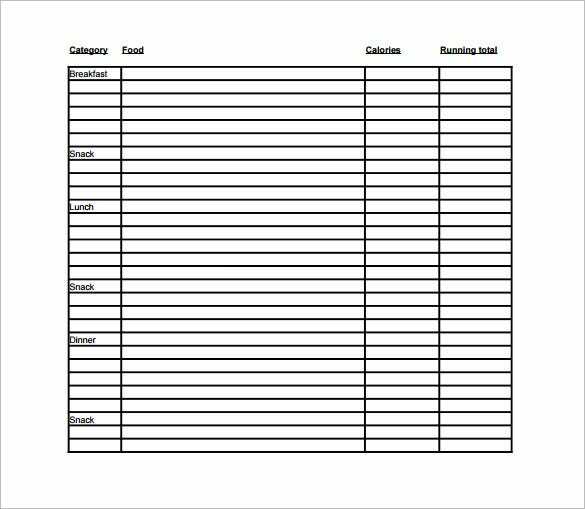 Weight Loss Chart Template – 9+ Free Word, Excel, PDF Format Download! Losing weight is perhaps the most difficult process there is. And if we want to make things faster and more efficient, it is important to record the changes that take place in our bodies on a daily basis. A chart is often made recording the change in body weight with time and the target that we set for ourselves. You can also see Run Chart Templates. 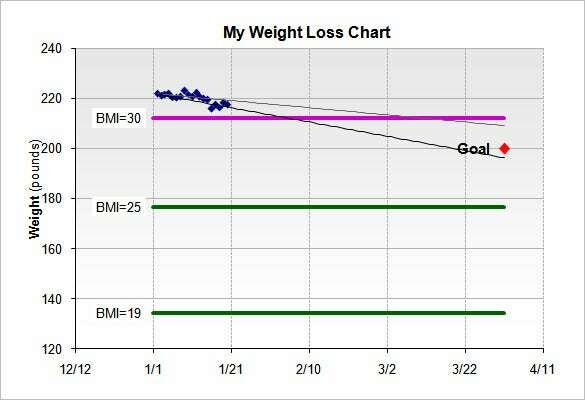 The blank weight loss chart template shows the initial BMI and the Final BMI that has to be accomplished within the said days. This helps the person keep track of the progress. 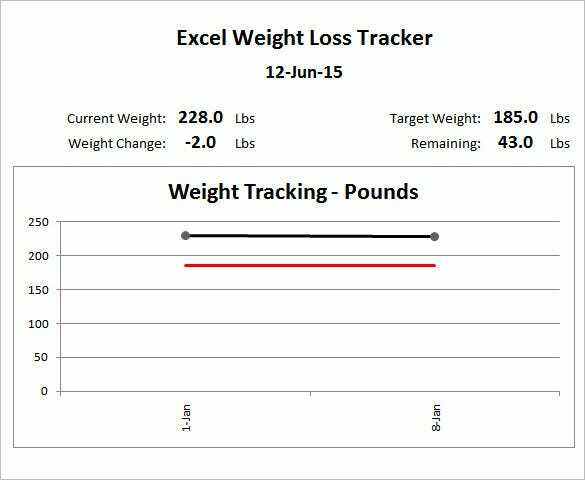 excelfunctions.net Weight Loss Tracker Chart is a great way of keeping track of your weight. 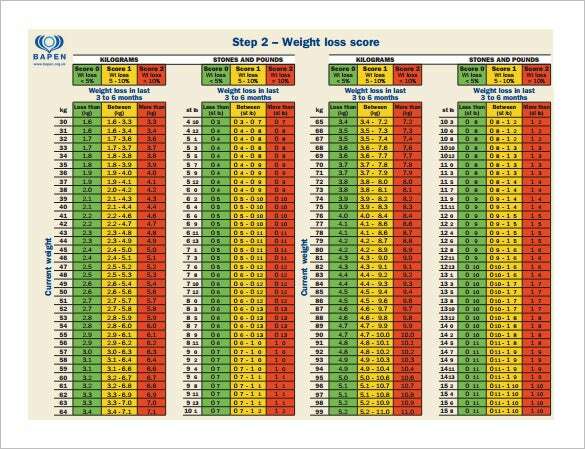 All you need to do is enter your weight periodically and this template will show how much difference has there been on a chart so that it is much easier to comprehend. 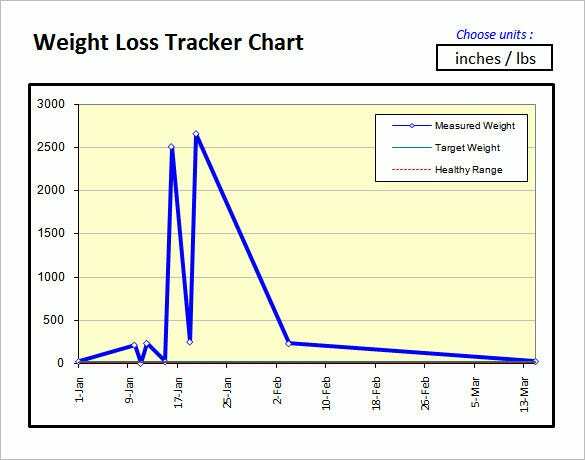 excelmadeeasy.com The weight tracking chart tracks the amount of progress the person is making every day. 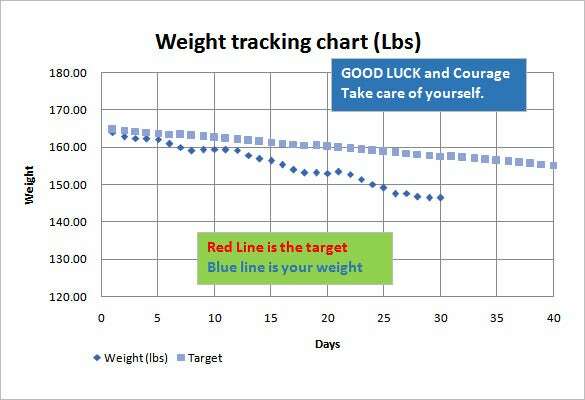 The light blue line indicated the prescribed target and the dark blue line indicated the present effort. hmrdiet.com | This weekly weight loss progress chart will help you to keep track of your calories everyday in relation to the consumption of different foods like fruits and veggies, bars & exercises. exercise4weightloss.com | The customizable weight loss tracker gives the user the power to customize his/her diet to lose weight. The person can write down alternatives in the diet for breakfast, lunch, dinner and snack. Well this breaks the monotonous diet plan providing alternative and also helping the person to count its calorie. 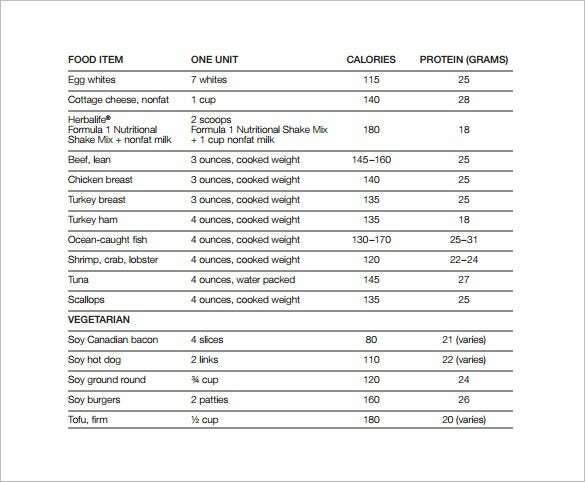 myherbalife.com | Group weight loss chart is a comprehensive diet chart which provides the calorie each food item contains. 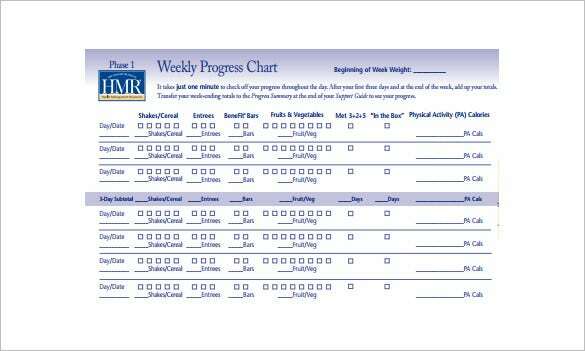 This helps the person to make a diet chart that will keep a count in calorie intake and help lose weight. gwens-nest.com | The weight loss tracking chart is for people who want to lose weight. 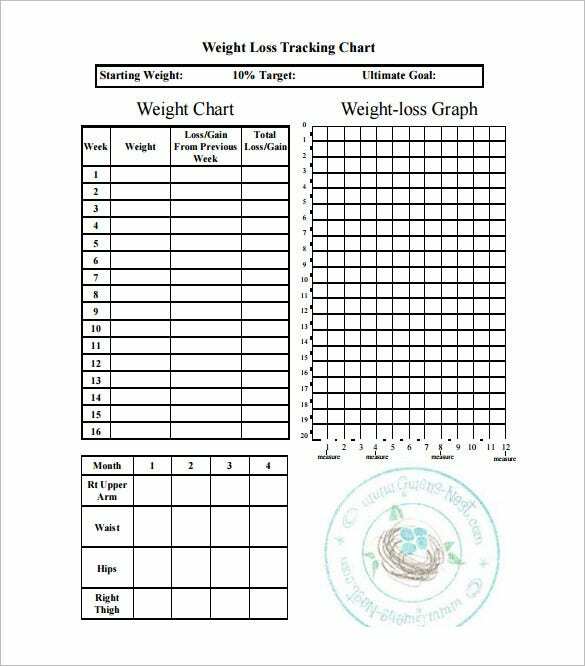 They can track their weight loss by using the weight chart, the weight-loss graph and also by measuring the size of upper arm, thigh, waist and hips every week. A free weight loss chart is just that – a record of the weight that was lost in a certain period of time. Often times, weight loss charts are made to make a record of the progress that was done regarding weight loss programs. A pie chart template is designed based on the necessity of the person trying to lose weight. 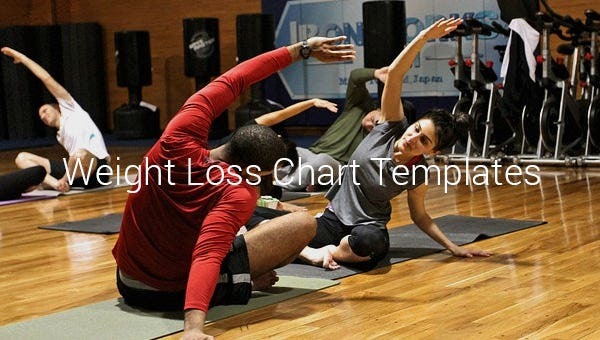 Before you download one of the sample weight loss chart templates that we have got for free, you should know what a Chart Templates such as that is usually made up of. Here are all the components of a weight loss chart template listed out chart to see Blood Pressure Chart Templates.